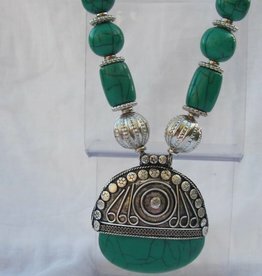 42cm long ethnic chain necklace with a sturdy pendant (6,50cm long) inlaid with green and coral coloured hars. Golden coloured. Hand made in Old Delhi. 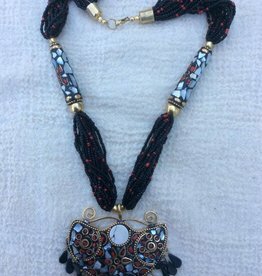 Bohemian Indian necklace with Yemeni arabische dreams. 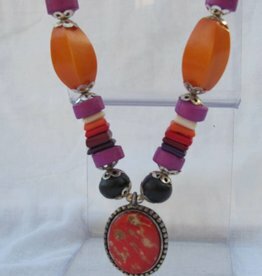 Great summer hippy necklace.Necklace length is 50cm,pendant length including little coins is 9 cm. white metal with agate stone. 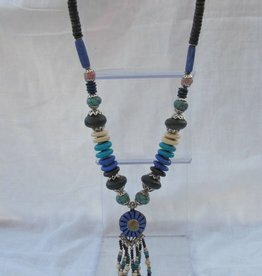 Handmade necklace with beaded tassel and attractive medallion. (hars with agate in the middle). Beads are all hand madefrom hars, metal and glass. Necklace is 52cm long and the tassel with the medallion measures 10cm. Ethnic necklace totally handmade in Old Delhiby a small scale workshop. Arabic Yemen style for the modern hippy look, set with a black stone and lots of coins. 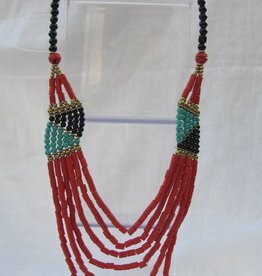 length of tribal necklace is 50cm excluding pendant 10cm (inc coins) x 8cm wide. Statement necklace. 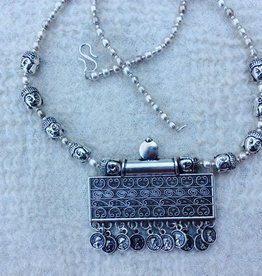 Five large elements of silvery metal, filled with carbouchon hars "stones" make this a real eye catcher necklace.Can hang to 50cm long but can be worn shorter due to the adjustable chain behind. respectfully made in Old Delhi. Ethnic necklace totally handmade in Old Delhiby a small scale workshop. Arabic Yemen style for the modern hippy look, set with a brown stone and lots of coins. 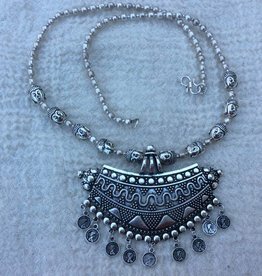 length of tribal necklace is 50cm excluding pendant 10cm (inc coins) x 8cm wide. 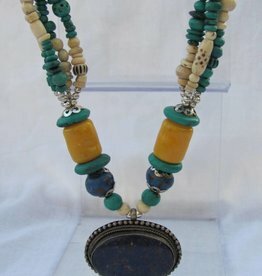 Necklace, handmade from beads of camel bone,horn and hars that are also handmade. 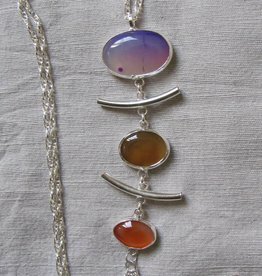 56cm long, with a pendant of agate set in silvery metal hanging down from it. Necklace is made in werkshop in old Delhi with respect for the artisans. India jewelry is always made by hand. This necklace also. Yemen meets the Buddah in this bohemian necklace. necklace is 52cm long excluding the pendant that is 8cm wide by 6,50cm long including the cute coins. Silver coloured finnish.